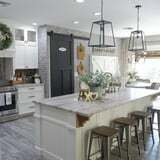 Farmhouse-inspired home decor is extremely popular right now thanks to shows like Fixer Upper and Joanna Gaines’s signature style. From traditional to vintage to even modern, the best part about this style is that it can be customized to meet several different design needs. And if you’re in the mood to do a little redecorating but aren’t sure where to start, why not turn to Instagram? The inspiration you’ll get from these popular farmhouse-inspired accounts will bring you an overload of ideas for your own space. From DIY projects to tips on finding affordable decor and redecorating options, keep reading to check out the best farmhouse Instagram accounts you need to follow.